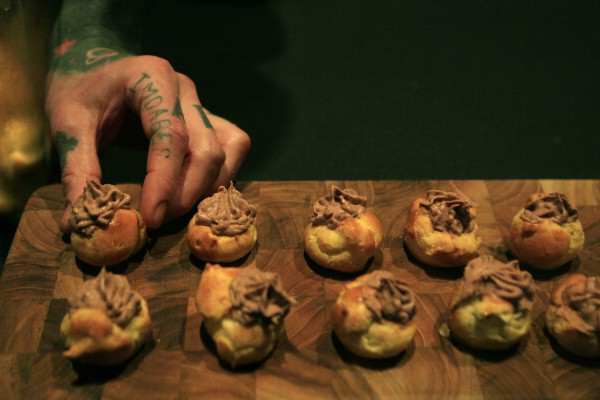 Michael Zito, Executive Chef at Cafe Claude, places chicken liver mousse in a pastry at the Taste of the Bay event presented by the Hospitality and Tourism Department at the City View on top of the Metreon in San Francisco, Calif., Wednesday, Nov. 12, 2014. Daniel Porter/Xpress. Exquisite culinary creations, California-grown wines and panoramic views of downtown San Francisco brought foodies together to enjoy a night put on by the hard-working students of SF State. Students of the hospitality and tourism management department have been encouraged overtime to volunteer at the University’s biggest ticketed fundraiser event from their first class all the way through graduation. Wednesday night celebrated the 18th annual Taste of the Bay at its most spacious venue yet: the City View located at the top of the Metreon shopping center in the South of Market neighborhood and home to sprawling views of the downtown area. “Seeing the event in full swing — when all the guests are enjoying their night — is probably the biggest high,” said event chair Jennifer Whitney in describing her favorite aspect of Taste of the Bay. Approaching graduation in December, Whitney has been a part of Taste of the Bay since she transferred from Ohlone College in her junior year. During her first semester in the program, Whitney volunteered for the event and knew she wanted it to lead her to her career in event planning. After her first year, Whitney joined the committee and held the title of restaurant manager in 2013. As restaurant manager, Whitney helped solicit restaurants and wineries to participate in the event. The committee is made up of 16 dedicated students who work together and plan all year to make the event bigger and better than the last. Now in her last semester, Whitney said her main goal this year was to get a larger space for the event. 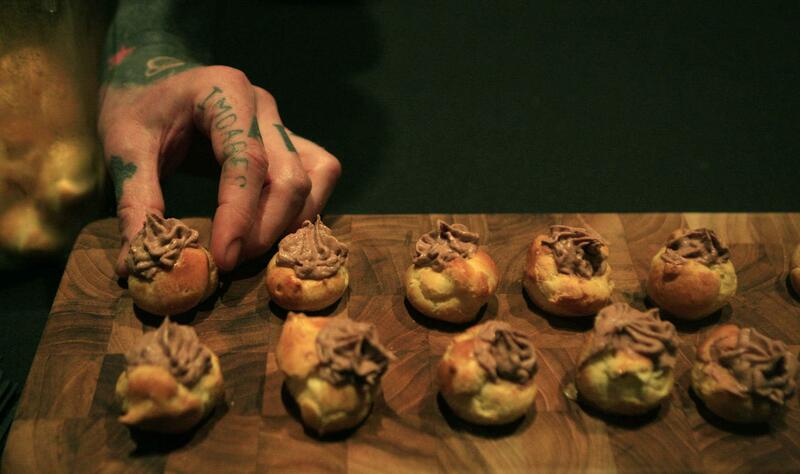 Taste of the Bay 2013 was held at the Julia Morgan Ballroom in the Financial District. In total, 20 restaurants and 19 wineries were featured at this year’s event, compared to 15 restaurants and 10 beverage vendors in 2013. Participating restaurants included BIN 38, Hillside Supper Club, Cowgirl Creamery, Luce and many more. Lagunitas Brewing Company, 21st Amendment Brewery and Hook & Ladder were just a few beverage vendors keeping guests’ thirsts satisfied. 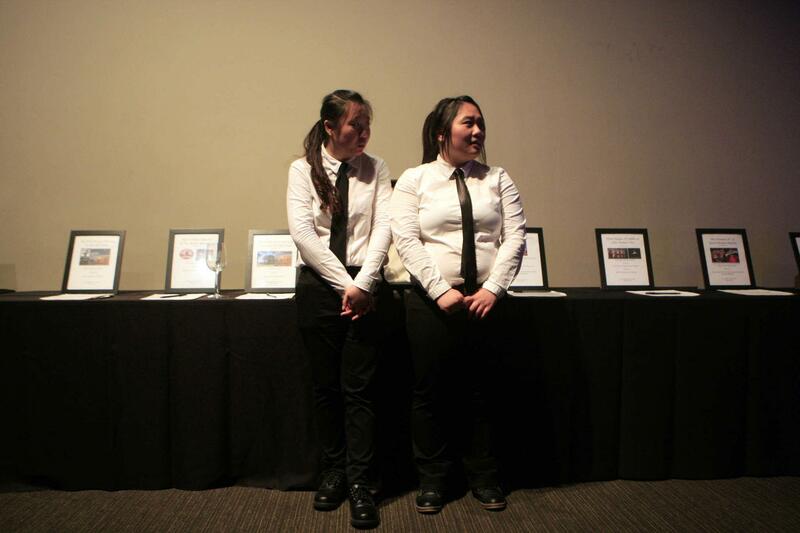 Mandy Liu, left, and Vicky Li, seniors in the hospitality and tourism management department, greet attendants in front of the silent auction table at the Taste of the Bay event at the City View on top of the Metreon in San Francisco, Calif., Wednesday Nov. 12, 2014. Daniel Porter/Xpress. “There’s a good number of vendors this year,” said hospitality and tourism management student Ortal Shaitrit. Shaitrit added that she enjoyed the decor and environment that the Metreon provided. As event chair, Whitney looks over the committee as a whole and also helps brings in sponsors. The money raised at the event directly impacts many students in the department, funding guest lecturers, SF State’s on-campus restaurant The Vista Room, student scholarships and other program needs. Annually, the event receives many donations and sponsors each year. Nancy Lee Mar, a friend of the University, is the biggest presenting sponsor of Taste of the Bay, donating $50,000 each year. Other sponsors included Lori’s Diner, which donates $10,000 annually and the JW Marriott, which provides hotel accommodations. Mariana Atwood, Taste of the Bay auction manager said in the initial stages it is discouraging asking for free items to the event, but in the end it is worth it after seeing how everything comes together. “The best part is seeing how much money we’ve made,” Atwood said. This year’s live auction raised more than $10,000 alone. A signed jersey by San Francisco Giants pitcher Matt Cain was the first of nine items to be auctioned off. Last year the student-driven event raised a $140,000 net profit and the committee believes they made even more this year, according to Whitney. In addition to raising money, Atwood said that being apart of the hospitality and tourism management department at SF State is rewarding in itself. Students who serve as committee members, who don’t already have a job in the hospitality industry, get a chance to see what is it like to run an event and go through the whole planning process. “This department provides a lot of opportunities to get involved and real world experiences that employers are looking for,” Atwood said.